Read our full review of the new Fujifilm X-H1, Fujifilm's flagship X series camera, with 5-axis Image Stabilisation, and CINE 4K video recording. Introduced as Fujifilm’s flagship X series camera, the X-H1 sits above the X-T2 and features 5-axis in-camera image stabilisation, CINE/DCI 4K video recording, and a new “Eterna” film simulation for video recording. The Fujifilm X-H1 will be available from March, priced at £1699 body only, or £1949 with the optional battery grip. The big headline feature of the X-H1 is in-camera sensor-shift image stabilisation, which Fujifilm call In-Body Image Stabilisation. IBIS moves the camera’s 24.3mp APS-C X-Trans III CMOS sensor, to give up to 5.5 stops of image stabilisation. There is a new spring mechanism to reduce vibration when using the mechanical shutter (built in shock-absorber system), and you can use an electronic front curtain shutter to reduce vibration further. The IBIS works in combination with optical image stabilisation (OIS), when this is in the lens, and will work with third-party lenses attached to an adapter. Behind the scenes, there's a 3-axis acceleration sensor and a 3-axis gyro sensor. On the back of the camera, there's a new AF-ON button. AutoFocus (AF) performance has been improved, with better low-light focus, with phase detection working down to -1EV. This is said to improve focus with fine detail, and video recording as well. The minimum aperture range has been improved down to f/11 (from f/8), which means phase detection autofocus can be used when using the XF100-400mm with the 2X TC WR tele-convertor. There are 91 AF points (which can be increased to 325). Flicker reduction mode – a new flicker detection mode has been added, for shooting continuously, so that the camera can shoot indoors and avoid shooting shots when there is flicker from fluorescent lighting. However, this does reduce the continuous shooting speed to 7fps with electronic-front curtain, and 5.5fps with mechanical shutter. Video recording has been updated to include DCI/CINE-4K video recording at 24p, up to 200Mbps (twice that of the X-T2). There’s also 4K UHD at 30/25/24/23.98fps for up to 15min, which can be extended to 30min with the new VPB-XH1 battery grip. There is also a larger internal heatsink in the camera to help extend video recording time. The camera has a FullHD / 1080, 120fps high-speed video mode so that you can playback video in 4 or 5x slow-motion. FullHD video can be recorded for up to 20 minutes, which is extended up to 30min with the battery grip. The camera is said to give up to 12 stops of dynamic range, with a 400% dynamic range setting for video recording. The camera can shoot at 14fps using the electronic shutter, or 8fps using the mechanical shutter. If you add the vertical battery grip, then the mechanical shutter can shoot at 11fps. The electronic viewfinder (EVF) has a resolution of 3.69 million dots and a magnification of 0.75x. It refreshes at 100fps (or 60fps). The rear 3inch touch-screen tilts in 3 directions and has a resolution of 1040K dots. 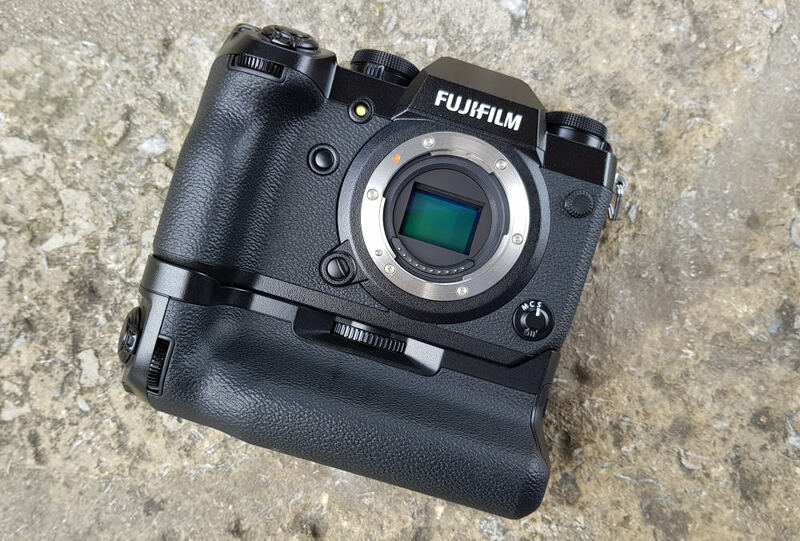 On top of the camera is a 1.28inch LCD screen, which is customisable, as found on the Fujifilm GFX 50S. The camera body weighs 673g with battery and memory card, and features a magnesium alloy construction that is 25% thicker than the X-T2 and is dust and water-resistant, capable of being used down to -10C. There is a new stronger external surface/coating that is scratch-resistant with a hardness equivalent to 8H. Fujifilm says the camera is 2x tougher than the previous camera, to enable the use of future (larger) lenses. The camera measures 139.8x97.3x85.5mm. The battery grip (VPB-XH1) adds a headphone socket, extends video recording time, and includes recharging capability – with the provided AC adapter you can charge two batteries at the same time. 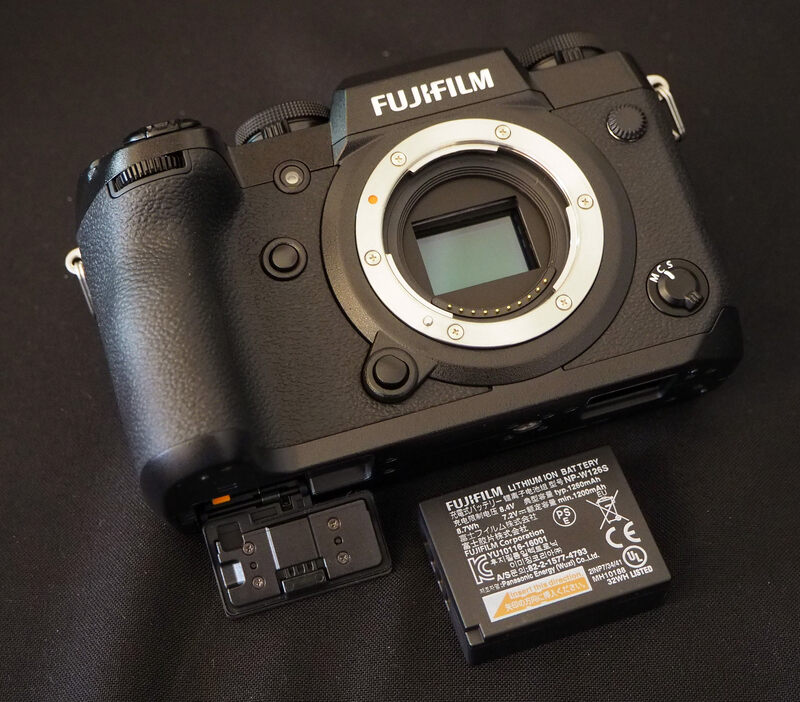 With the battery grip, the camera can shoot up to 1000 shots, without the optional battery grip, the camera’s battery life is only 310 shots, so a spare battery is likely to be needed. A small external flash, the EF-X8, is included in the box. F-log (4:2:2 8bit) colour space defined according to ITU-R BT.2020. Eterna Film simulation is new and is designed for shooting movies, simulating cinematic film (with undersaturated colours and rich shadow tones) – ideal for further post-processing. The shutter release button has a leaf-spring, which makes the shutter release button quite sensitive, and the difference between a half-press for focus and a full press is quite small. There’s a large grip, with a new shape, giving you plenty to hold on to, and the rear has a large protruding area for your thumb to hold on to, with plenty of space to rest your thumb. It’s now much easier to hold the camera with one hand should you wish to. It also makes it more suitable for use with larger lenses. The build quality of the camera is excellent, with the camera feeling very robust and solid. The controls and buttons can be customised so that you can set the camera to operate how you want. The 3inch touch-screen, has 1040K dots, and can be tilted up, and down, and also sideways so that if you are shooting vertically (or in portrait mode) you can tilt it up towards you, for low-down shooting. The screen quality is very good, with a gapless design, making it clearer to view. The colour reproduction of both the screen and EVF match each other, and the electronic viewfinder looks great, with a high resolution, and a quick refresh rate. 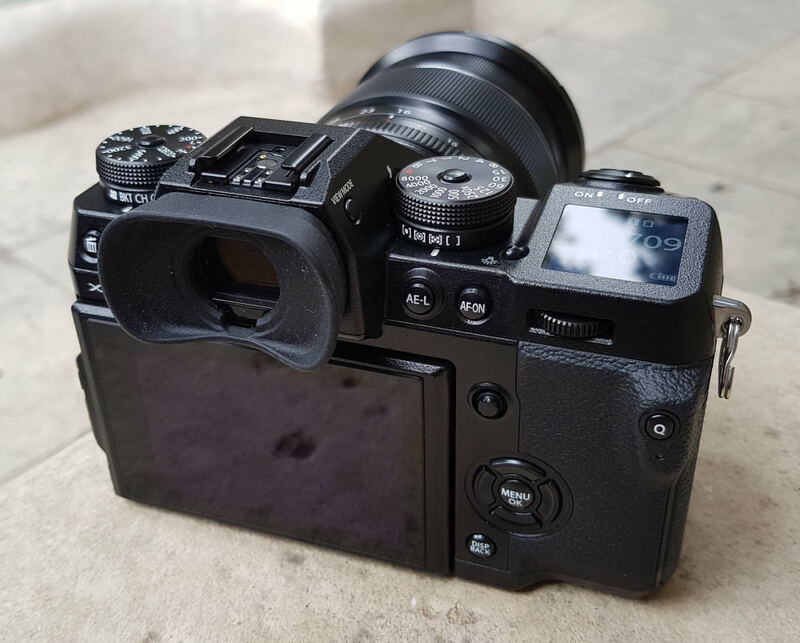 The top LCD screen lets you see how many shots you have remaining, exposure compensation setting, memory card slot in use, and the battery life remaining, even when the camera is off, so you can quickly see whether you’re ready to shoot without having to switch the camera on. The menus are clearly laid out, however, the amount of options and settings continues to increase, and you can end up going quite deep into the menus to find the settings you want. For example, setting up the bracketing drive mode requires quite a lot of time spent in the menu system. Luckily, you can use the "My Menu" screen to add your favourite settings, to give quicker access to the settings and options you use. The shutter is quiet, particularly with the lens on. Fujifilm says it is the quietest of all X series cameras. The 5-axis sensor-based image stabilisation emits a quiet “whine” or hum for want of a better word, much like other cameras with sensor-based image stabilisation, although you’ll only notice this in quiet environments. You can choose between "Continuous" in-camera image stabilisation, "Shooting Only" or switch it off. The AF-ON button on the back is new, letting you focus using your thumb. The joystick on the back to can be used to set the focus position, this can be locked off, or set so that you have to press it in to unlock it. The focus position can be set to any point from left to right, and roughly 70-80 percent vertically. The top dials for ISO speed and shutter speed are both lockable, and you can press the middle button in to lock them into place or release the middle button to free them. 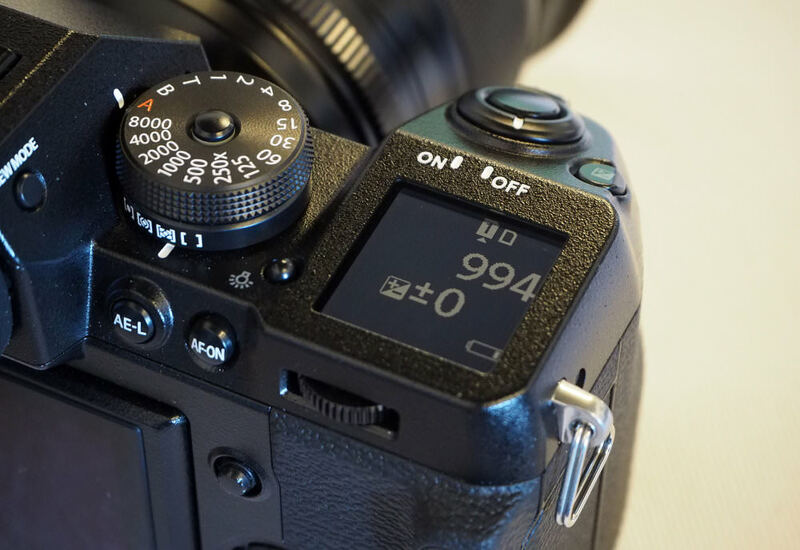 There is no longer an exposure compensation dial on top of the camera, and instead, there is a button next to the shutter release button so that you can adjust the exposure compensation with one of the command dials. 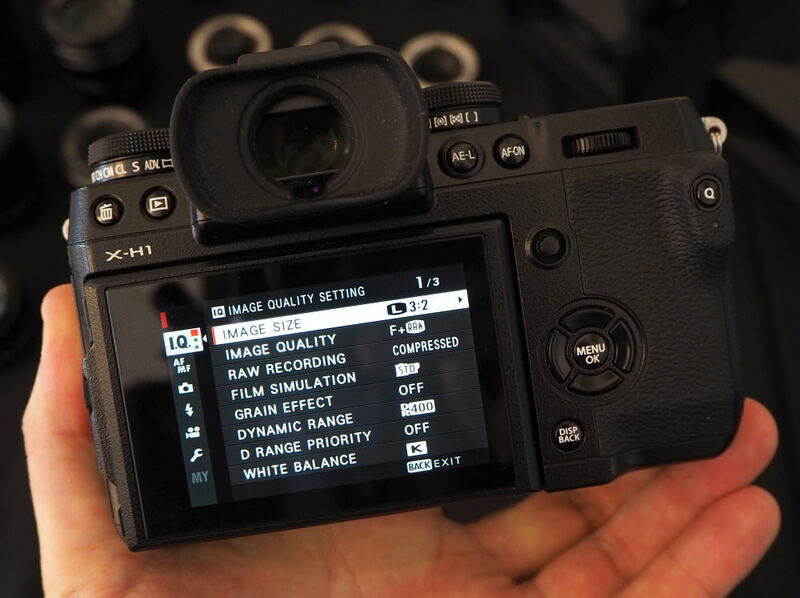 The front and rear command dials have been improved, and are now meant to have a better grip, although the difference is quite subtle unless you're comparing the X-H1 and X-T2 side-by-side. The buttons have been made larger than previous cameras, and are no longer flat. There are dual SD card slots on the side of the camera. Battery life is a little short when the optional battery grip isn't attached, with the camera offering 310 shots. It's a shame this hasn't been improved, although if you do add the battery grip, then this gives you a total of 3 batteries, which gives three times as many shots. If you don't want to add the optional battery grip, then we'd definitely recommend the purchase of some spare batteries. Very nice layout and looks good. But not full frame, why fuji cant make Full Frame!!!! Come on Nikon!! A full frame Mirrorless camera like this and I will be first in line. Get a life guys. I sold my D800 and pro glass for a Panasonic M43. I'm looking at a print (framed at 30"x22") on my living room wall that's won awards at 3 juried shows. It was shot with the Lumix not the Nikon. Unless you are printing at 4'x6' or something else extreme, almost any current interchangeable lens camera is good enough, that is unless you spend all your time pixel peeping at 200% on your monitor and don't actually make prints. Prima facie it seems an excellent proposition, I note also that Fuji have kept faith with the battery being the same as the one in the X-T2 and compatible with that of the X-T1, I may yet buy one but will await any (if any) bugs or snags. Why do you people want full frame? The difference is negligible. Go get a medium format. You know the GFX 50s is about the same weight as a full frame DSLR? Now that'd be a difference! Why do you people want full frame? The difference is negligible. Go get a medium format. You know the GFX 50s is about the same weight as a full frame DSLR? Now that'd be a difference! I wish more portrait shots had been included. In the one shot where a figure is reasonably prominent, the skin tones look waxy, but I couldn't really make a judgement on that sample alone. IQ seems OK, but there's nothing stand out about it. As I'm invested in the Nikon system, I'll wait to see what mirrorless offering they come up with (if they ever do). In the meantime, I'm happy with my DSLRs and my Panasonics. By the way, the introduction of IBIS is not a mirrorless innovation as the article seems to suggest, as Pentax has had this in their DSLRs for years. I think Minolta did too, but I could be wrong about that. 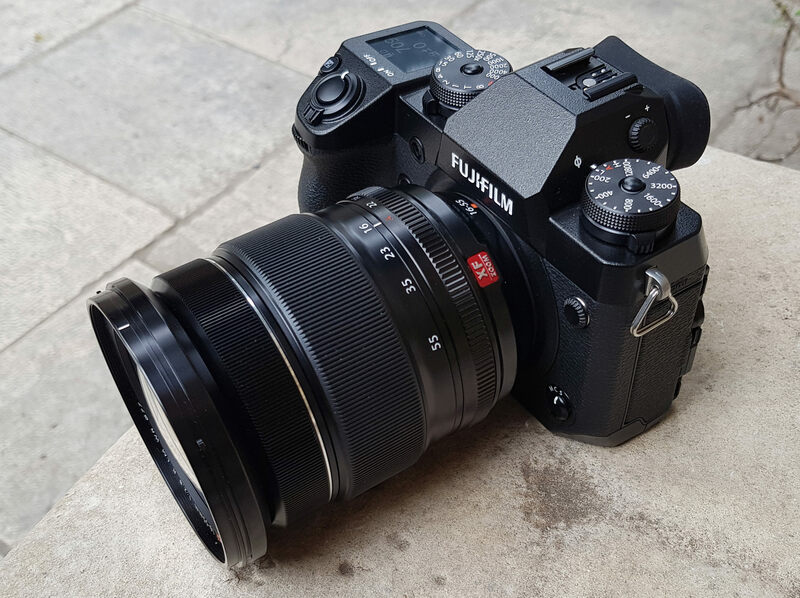 Interesting review but if the the BIG thing about this Fuji is the in-body stabilization, why not [b]show[/b] several shots at very slow shutter speeds? Such as 1/2 second or less? All of the outdoor shots were taken at ISO 800?? How does that emphasis the point of IBIS? Also, the noise reduction of those outdoor shots is pretty severe. Excellent IBIS in 4K panning video. Kudos. On main page of your review you mention that IBIS can be set to continuous or “Shooting Only.” Does [i]shooting only[/i] mean only at the point of exposure? Or does it mean during the focus process, as in when focusing manually? And I did not see any mention of the missing Exp.Compensation dial, or how the little button replacing it (next to the shutter release) can be set to Toggle, ON or OFF. Interesting review but if the the BIG thing about this Fuji is the in-body stabilization, why not show several shots at very slow shutter speeds? Such as 1/2 second or less? All of the outdoor shots were taken at ISO 800?? How does that emphasis the point of IBIS? Also, the noise reduction of those outdoor shots is pretty severe. Excellent IBIS in 4K panning video. Kudos. On main page of your review you mention that IBIS can be set to continuous or “Shooting Only.” Does shooting only mean only at the point of exposure? Or does it mean during the focus process, as in when focusing manually? 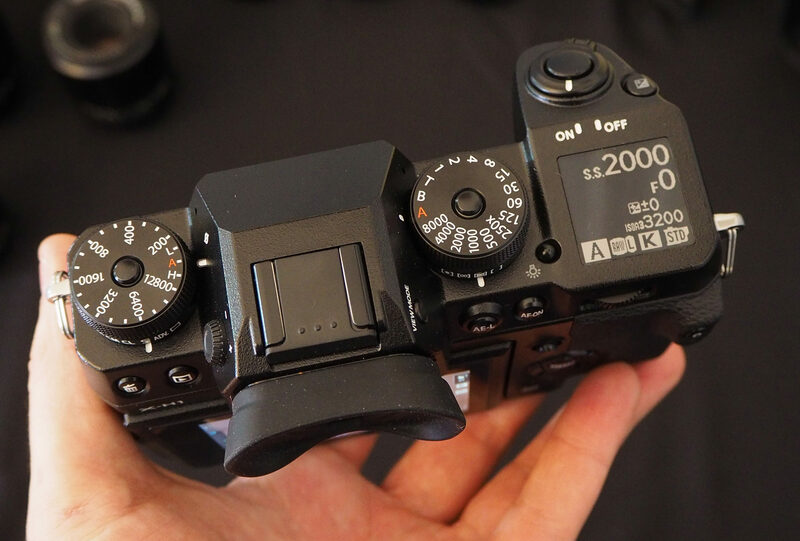 And I did not see any mention of the missing Exp.Compensation dial, or how the little button replacing it (next to the shutter release) can be set to Toggle, ON or OFF. Mobile phones have decimated the small compact camera market. Manufacturers trying to revive the dead compact market with 1 inch sensor offerings. Leaving Micro 4/3, APS C, Full Frame, Pseudo-medium format (not true 645 sensor size). Pseudo-medium format (not true 645 sensor size) market is too expensive at the moment. There will be a fight among Micro 4/3, APS C, Full Frame. You are either small or big. Squeezing out "medium". Ironically Micro 4/3 survives due to its smallness. Many everyday consumers hate big cameras and the quality of Micro 4/3 output is acceptable to them. Demanding consumers will want Full Frame. With technology improving, "medium" will die. That means APS-C. At some time in near future, Fuji will have no choice. Fuji has to abandon APS-C and go Full Frame. Or else Fuji will flush it self down the toilet, like Kodak obstinately refusing to accept technological change. Mobile phones have decimated the small compact camera market. Manufacturers trying to revive the dead compact market with 1 inch sensor offerings. Leaving Micro 4/3, APS C, Full Frame, Pseudo-medium format (not true 645 sensor size). Pseudo-medium format (not true 645 sensor size) market is too expensive at the moment. There will be a fight among Micro 4/3, APS C, Full Frame. You are either small or big. Squeezing out "medium". Ironically Micro 4/3 survives due to its smallness. Many everyday consumers hate big cameras and the quality of Micro 4/3 output is acceptable to them. Demanding consumers will want Full Frame. With technology improving, "medium" will die. At some time in near future, Fuji will have no choice. 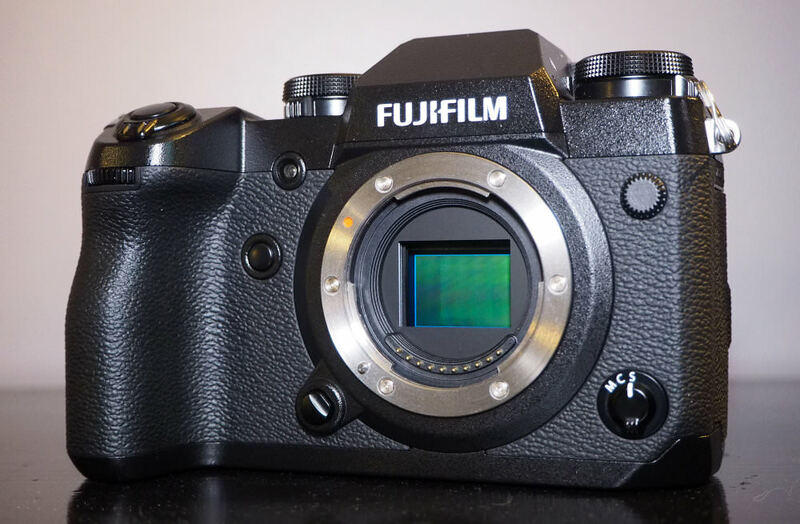 Fuji has to abandon APS-C and go Full Frame. Or else Fuji will flush it self down the toilet, like Kodak obstinately refusing to accept technological change. Looks like a superb cam. Great addition to the fujifilm line up.